Super Smash Bros. has an fascinating relationship with its community. When Melee came out, it introduced a host of techniques, some intentional but many not, that gave the game a huge amount of depth, and eventually players found those techniques and created a competitive scene out of it. Rather than capitalize on this, though, Nintendo, and most notably lead designer Masahiro Sakurai, believed that this competitive approach went against the intent of the game. When Brawl was released, it included many changes explicitly designed to make it less competitive and get rid of the exploits that players discovered. While the latest Smash game took steps to appease both casual and competitive players, it took a long time for Nintendo to even get that far, and the shadow of Melee still hangs over it. In-between then, though, fans took matters into their own hands, creating nebulously legal add-ons to the games and even creating whole new Super Smash Bros. games, also somewhat nebulously legal. But Rivals of Aether not only manages to stand apart from Super Smash Bros. as a compelling fighter, it makes a serious case that this game should be the platform fighting game that others should be judged by. In other words, if you have ever played, watched, or wanted to play and watch competitive Super Smash Bros., you should pay attention to this game. Those familiar with Super Smash Bros. know generally what to generally expect from Rivals, though it does several key things differently that make it both deeper and more accessible. Just like in Smash, you pick a character and play king of the hill on a stage. Knock an opponent off the stage, and they will attempt to use double jumps, wall-jumps, dodges, and special moves to get back on the stage while you attempt to stop them with your own attacks. Characters who have higher damage are knocked further with attacks, meaning matches usually start with players trying to deal damage while avoiding attacks but end with huge struggles to stay on the stage. Just like in Smash, none of the attacks are particularly hard to pull off, but knowing when and where to use them makes all the difference. Rivals in many ways is a return to the deeper style of Super Smash Bros. Melee, but at the same time, it refines, modernizes, and makes it more accessible so that general audiences will have no trouble getting into it. For example, this game sees the return of wavedashing (doing an air dodge into the ground that gives characters more movement options), but where in Melee this was an advanced and difficult technique that culled casual players from the pros, in Rivals it is relatively easy to pull off and not even as necessary. This approach is also helped by the fact that Rivals has an excellent tutorial mode. Most tutorials in fighting games are content to walk through what the buttons do and show some combos, but Rivals goes deeper than that. It not only goes through what the basics of the game are, but it also defines all the key terms used in the game and walks players through the thought processes behind the gameplay. A combo tutorial will not only teach players how to do the combo, but challenge them to learn to read enemy behavior and explain when and where that combo is effective. There are even tutorials for each individual character delving into the strengths, weaknesses, and general strategies of them. It is so refreshing to see a game with deep mechanics and competitive gameplay that does not need players to visit a YouTube tutorial to see what is going on. There are 8 characters, each based on an animal associated with an element, and while they all feel very different from each other, none of them seem particularly over or underpowered. Some of them are more accessible than others. Zetterburn and Kragg, a fire lion and earth beatle respectively, are characters who can hit hard and take a lot of damage, making them ideal starting points. Other characters, like Absa, the electric sheep person, and Forsburn, the other fire lion, require more playtime and are not immediately accessible. However, skilled players will be able to impressive tricks with them. Even for the simpler characters though, there is a finesse required to making the characters effective. It is also impressive how strong and viable Kragg and Etalus, the two big heavy hitters, feel in this fast-paced game. There are no items in this game, but each of the characters has a unique mechanic that alters the playing field. Kragg can lay down breakable rocks and stone walls, Zetterburn can set the stage on fire, Forsburn can fill the stage with smoke, etc. These stage altering mechanics go a long way toward making each fight exciting and different. Players who forget to pay attention to them could end up accruing damage quickly or even freezing in place. Honestly, I do miss having items in the game. I liked the element of randomness, one that emphasizes players to leave the relative safety of the center of the stage to risk getting an advantage, and I would have loved to see Rivals attempt to make them competitive (because they sure are not in Smash), but these mechanics do feel like an effective compromise. It cannot be overstated, though, how good playing Rivals feels. No matter which character you choose, you have plenty of movement options, attack types, and defensive maneuvers. Dan Fornace, the lead developer, did a fantastic job of layering mechanic upon mechanic so each move can be used many different ways. Forsburn can use his aforementioned smoke to avoid enemy attacks or set up his own. Another of one of the characters, Maypul, can use her tethers to close the distance between her and the enemy quickly, allowing her to avoid attacks or get close for a kill move. Zetterburn’s flame attacks can rack up damage or prevent enemies from approaching. All of this depth is hidden behind relatively simple mechanics, so they never feel overwhelming to new players. Instead, playing the game is a constant source of revelation upon revelation as players uncover the potential to their chosen characters. 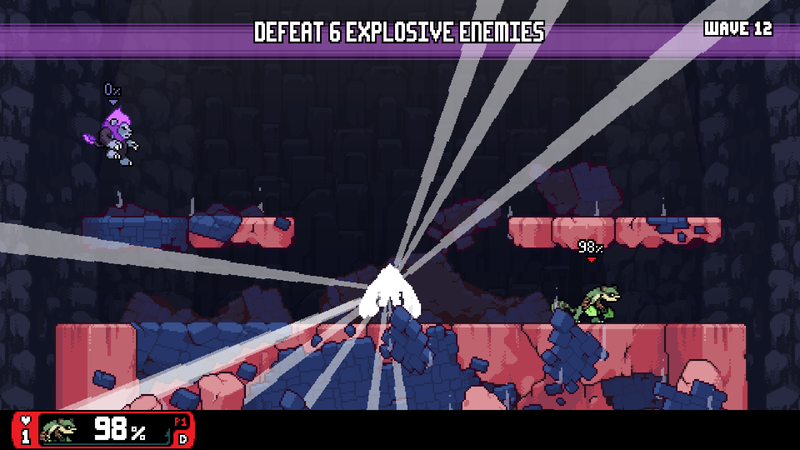 Because it is a multiplayer focused game, Rivals of Aether’s long-term success will be likely based on its online offerings, and fortunately all the basics are covered. There is an Exhibition Mode for friendly matches, a Ranked mode that gives you an MMR based on your performance, and even a team match mode (for internet connection purposes, though, you can only play with two systems online). These modes work mostly as one would expect, and internet play is incredibly solid. What is appreciated is the number of quality of life features included. The warmup feature in particular is really welcome, as it is such a simple feature elegantly implemented that makes the whole experience a bit more pleasant. It should be noted that it is hard to find a match sometimes, especially during off hours when I was trying to play, but the game allows you to accept or reject ranked matches based on ping, so you never feel burned by a bad connection. Multiplayer is really where the game shines. The game quickly descends into mindgames where the victor is decided based on how well they predict their opponent’s moves almost as much as how well they are able to pull off their own. This is a fast and offensive game, but characters have a lot of ways to shut down their opponent’s combos and turn the match around, so victory is never assured. However, when playing ranked mode, I did quickly see my rank fall, and for good reason. A lot of the playerbase has been playing this game for the past year in Early Access, and even before that, many were playing other Smash games and building relevant skills, so new players may justifiably find themselves overwhelmed. The game was still enjoyable, but the online can be intimidating. For them (and me), there are single-player options available. There are bots available for offline matches, and the AI is serviceable, even if it is nowhere near the skill level of the playerbase. However, the meat of the single-player content is in the Story and Abyss modes. The Story mode is essentially what every fighting game story mode is like and is therefore only a disappointment if you expected it to be something better. You have three lives to get through five matches against single AI opponents, and in-between matches there are short scenes of still art and text that develop the story and lore. The game’s story takes itself surprisingly seriously, and it spends time developing and hinting at different factions and governments that make up the land. It almost feels like a spiritual cousin to something like Sonic the Hedgehog’s lore, but more focused on economy and politics, so your mileage may vary on how much it appeals to you. The story mode ends with a rather impressive boss fight that leads straight into the other main single-player content: Abyss mode. In Abyss mode, you fight through wave after wave of challenges in a shifting environment trying to survive. One moment enemies will be swarming you, another moment you will have to hit some targets, and another moment enemies will be coming after you again but this time the stage will be exploding. I am not sure if this mode is particularly well-designed or if the base mechanics of the game are strong enough to carry it, but either way, this mode is more fun than it is any right to be. The constant change-ups and different challenges keep this mode exciting even after repeated playthroughs. This mode can also be played co-op by up to four players, which is great for people who have friends, want to play this game with them, and still want to be friends after the game is done. Unfortunately, this is only available locally. There are only two big issues with this mode. For one, it is not random enough. You are not going to see much repetition on each individual playthrough given that there are so many types of waves, but there is a set order to them. After playing it over and over again, the order becomes ingrained and predictable. This mode is practically begging to be randomized and it is a bit baffling that it isn’t. The other issue is that the aforementioned grind is very grindy. Leveling up takes forever in this mode, and to equip runes, you have to buy them with coins that you also have to grind for. Fortunately you can earn coins by playing in any mode, but those coins are also used to unlock characters and stages. If there is one area where this game falls flat in comparison to Smash, it is that unlocking things here is so boring and monotonous. I miss the days when characters and stages were awarded for doing something special in the game. One of the stages is unlocked by getting a certain achievement, but that achievement is for leveling up characters in Abyss mode, which again is a grind. It should be noted though that this grind is for offline content only and mostly relegated to Abyss mode. This is important because picking stages is an essential part of online play, and players who did not have access to stages would be at a significant disadvantage compared to those who did. The presentation in this game feels mostly utilitarian, but the game makes a strong case for how graphics and sound can support game design rather than just decorate it. This is a sprite-based game, but it does not seek to use that style to create sweeping vistas like Owlboy or complex tapestries like Sword & Sworcery. Instead, the style seems deliberately chosen and used to complement the fast-paced gameplay. Backgrounds, stages, and characters are bright and colorful but only draw the eye when there is something relevant to the gameplay. Animations are clear and readable, which is crucial for a fighting game, but what is particularly impressive are the distinct silhouettes. Even when playing the Abyss mode, which casts all the enemies as different shades of purple, the hectic action is never hard to read or understand. If this sounds like I am saying the game is boring looking or sounding, that is not the case. I am a huge fan of the design of Orcane, the whale-dog, mainly for convincing me that “whale-dog” is something I needed in my life, but all of the character sprites feature a lot of personality and distinctive features. Similarly, the music fits the matches perfectly, featuring lots of quick tempos and high chiptune melodies. 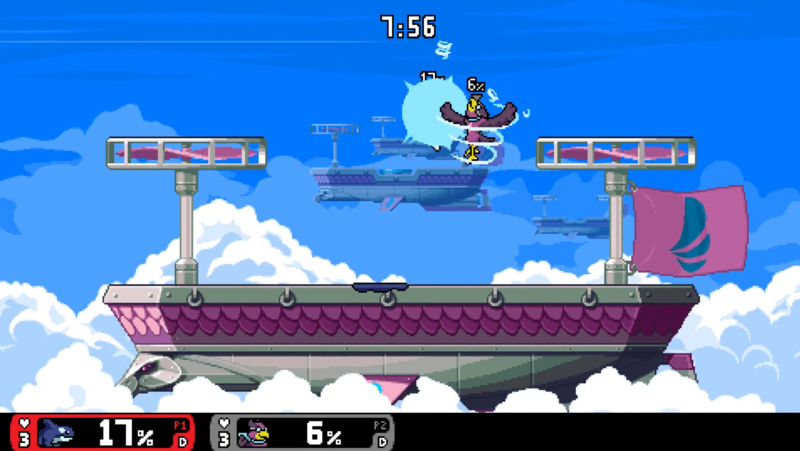 What is most impressive about Rivals of Aether is that, unlike its inspirational series, rather than try to serve casual audiences and competitive audiences with completely different features and mechanics, Rivals instead attempts to make the competitive side as appealing as it can for everyone regardless of their skill level. In this attempt, it succeeds gloriously. While others may argue with me over skill ceilings and techniques, in terms of accessibility for newcomers, depth for veterans, and helpful features for everyone, Rivals of Aether is the most complete and best competitive Smash game out there, and I am excited to see the future of it.